First, another hated section of road walking. Boo. Boo! 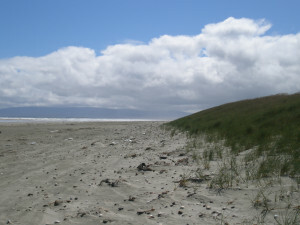 A couple of hours out past Invercargill airport and down to the famous Oreti beach, where Burt Monroe trained on The World’s Fastest Indian. It was a lovely beach, and I don’t say that just because it wasn’t tarmac. It really was – and better, people were using it as intended: walking, dog-walking, kite-surfing, swimming… It was also nice and easy to walk on, the sand well-compacted but not too hard. The tide was out, but I didn’t want to take any chances, and so I motored along the beach singing Motown at the top of my lungs to give me a beat to walk to (hey, there was no-one around to suffer my voice but me). Later than I had hoped, I came to the creek, stripped from the waist down, and waded across – only to find that the water only came a couple of inches above my ankles. It was not long after this, kind of exhausted already, that Oreti turned slightly evil. 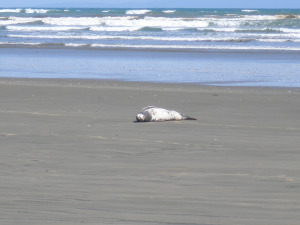 Even coming across a seal sunning itself on the sand could only cheer me up for a few minutes. I could see Riverton in the distance, seeming close enough that I could reach out and touch it. I tell you, it didn’t seem one step closer for the next three hours. I kept thinking to myself “Must be there soon!” but it was like I was walking on a treadmill rather than a beach. Calling up the Globe Backpackers in Riverton gave me some breathing space – they had a music night on and so were going to be open very late. Which was good, as I finally staggered in about 8 pm, feeling as if I had knives in my feet. It took me all of three minutes to drop the bag and head for the bar – I’d been dreaming about beer for hours. And can I just say, the Globe is a fantastic place to stay. More like an old-fashioned family pub than a backpackers, it was friendly and cheap and delightful in every respect. I immediately booked myself in for two nights, because damned if I was walking another step the next day. (Although, surprisingly, the next day my feet were fine – certainly not like they’d been in Invercargill, where I was practically hobbled. But being lazy I took the rest day anyway. Hey – the idea of this blog is to get fit, not get fit in one quick horrible swoop).